Nadiya Miftakhova came to Canada from Ukraine. She has known herself to have strong leadership qualities. She was looking to put those skills to use in a career that is both challenging and rewarding. After learning about the Master of Public Administration program at the Johnson Shoyama Graduate School of Public Policy, she knew she had to come to Canada to explore her potential in the public sector. As this year’s group of 86 graduands prepare for convocation, we asked Nadiya Miftakhova (Master of Public Administration ’18) about her time with the Johnson Shoyama Graduate School of Public Policy. Here is what Nadiya had to say. 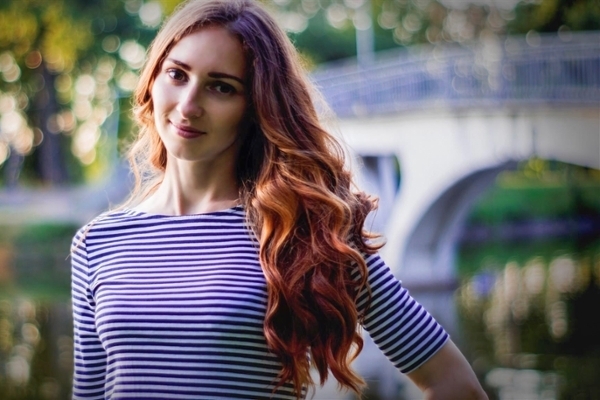 Nadiya: I was born and raised in Ukraine, and I received my undergraduate Bachelor’s Degree in Business Administration from the National Technical University of Oil and Gas in Ivano-Frankivsk, Ukraine. I have always been interested in active and ambitious leadership positions, and I look for any opportunity to develop my personal and professional skills. After working in both the public and the private sector, I found myself looking for more opportunities and knowledge in public administration. I was introduced to the Johnson Shoyama Graduate School of Public Policy while I was in school in Ukraine. After learning a little more about the School, I knew that it would be the perfect place to further my education, so I applied to the University of Regina campus. I was so excited when I received my acceptance! Q: What was one of your biggest challenges while learning in a new country? Nadiya: It took some time to understand and learn about Canada’s government and public sector. I had to do some catching up to understand particular local, provincial, or federal issues and policy decisions in Canada. Fortunately, I had a great support system throughout my program. My sister, Nataliya, joined me in enrolling for the MPA program. We encouraged each other to do our best, and I was thankful to have her to study with. Q: Which class was most memorable? Nadiya: For me, the most memorable class was my first block class with Ken Rasmussen, Governance and Administration. It was a very challenging course but I learned a great deal of valuable information about public policy and administration. I remember researching an issue all evening to prepare for my first briefing note! Q: What are some of your favourite JSGS memories? Nadiya: There are so many different events and opportunities to take advantage of! My favourite moments were the lunch and learn opportunities that were part of the Executive Internship program. During the lunch and learns, the interns had the opportunity to hear from excellent guest speakers from the federal and provincial government. I greatly appreciated the knowledge and insight they had to offer. Q: Where were you working during your internship and what did you learn? Nadiya: I worked for the Crown Investments Corporation of Saskatchewan (CIC) – the holding company for Saskatchewan’s commercial crown corporations. The internship has helped me to gain a deeper understanding and obtain valuable experience in public policy analysis, strategic planning, governance, and leadership in the public sector. I was fortunate to be involved in many interesting projects at CIC. It was a truly valuable experience. Q: What did you discover about yourself, as a result of the program? Nadiya: In the Negotiation and Conflict Resolution course, I found that I had very strong negotiation skills. This course helped me to understand and experience different strategies in problem-solving, negotiation tactics, and how to build self-confidence. I also learned to be self-critical as well. While this course is intended to provide a theoretical foundation that is useful in understanding dispute resolution, Professor Robert Hawkins brought the course to life by simulating negotiation and dispute resolution through exercises and role-plays. Q: How have all of your experiences with the JSGS contributed to your personal and career growth? Nadiya: I really enjoyed studying at a high-quality, practice-oriented School that invested in future public service leadership by preparing students for success in public administration and policy work. The courses and professors provided a rich learning experience that I classify as a significant advantage in my career development. Through the Ethical Democracy and Leadership course, I learned a lot about myself and I was able to identify my strengths and weakness. I became aware of the motives behind my actions and values as well. I learned that self-awareness is fundamental in evaluating your progress and we are the CEO of ourselves. I will continually improve through lifelong learning, studying, and gaining work experience. The MPA program provided me with the knowledge and skills I need to become an effective public servant in Canada. Q: What advice would you give to future MPA students? Nadiya: Besides a valuable learning experience, the School provides great opportunities for students to network with public sector professionals through a wide array of events. I would encourage students who are interested in the program to take advantage of all of the opportunities provided by the School, to go to events, to network, and to make friends. I also highly recommend that one stays up to date on important policy issues and decisions at the provincial and federal levels! Q: With convocation approaching, what are you most looking forward to after walking across the stage? Nadiya: With my strong foundation built at the JSGS, I am looking forward to lending my newfound knowledge into the real world. I hope to make a difference in the world of public policy and contribute to solving problems and issues faced by the province of Saskatchewan. On June 6, Nadiya Miftakhova will be one of 20 MPA students to graduate from the University of Regina campus, joined by 19 Master of Health Administration and 15 Master's Certificate graduands. The University of Saskatchewan campus will see 22 MPA, five Master of Public Policy, three Master of Northern Governance, and 2 Ph.D. in Public Policy graduands cross the stage the day prior, on June 5. These 86 graduates will be joining over 800 JSGS alumni worldwide.